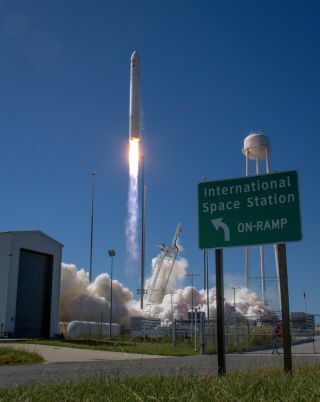 The Orbital Sciences Corporation Antares rocket, with the Cygnus cargo spacecraft aboard, is seen as it launches from Pad-0A of the Mid-Atlantic Regional Spaceport (MARS), Wednesday, Sept. 18, 2013, NASA Wallops Flight Facility, Virginia. A humorous road sign stands in the foreground. Early-bird skywatchers across parts of the United States and southern Canada have several chances to spot the new private Cygnus spacecraft as it chases the International Space Station across the pre-dawn sky. The first Cygnus spacecraft launched into orbit Wednesday (Sept. 18) from Wallops Island, Va., and is slated to arrive at the space station Sunday morning (Sept. 22) at 7:25 a.m. EDT (1125 GMT). So by Monday morning, both spacecraft will appear as a singular bright moving "star" across the night sky. This means that, weather permitting, it will be possible to see both space vehicles in the sky at the same time. Observers will see the space station appear first, followed closely by Cygnus traveling along basically the same path. How bright will they be? Most satellites in space are visible from the ground only when they are in sunlight and the observer is in deep twilight or darkness. This usually means shortly after dusk or before dawn. The International Space Station is about as long as a football field and flanked by huge, wing-like solar arrays, making it the largest artificial structure ever built in space. Because of its size highly reflective solar panels, the station is also the brightest man-made object currently in orbit around the Earth. On favorable passes, the space station can shine as brilliant as the planet Venus and appear more than 25 brighter than Sirius, the brightest star in the night sky. Some observers even caught a glimpse of the space station just prior to sunset or shortly after sunrise. And as a bonus, sunlight glinting directly off the solar panels can sometimes make the station appear to briefly flare to super-brilliance. Orbital Sciences' Cygnus spacecraft on the other hand, is a smaller unmanned cargo ship for the station developed by Orbital Sciences Corp. as part of NASA's Commercial Orbital Transportation Services program.Cygnus is much smaller than the Space Station, measuring about (17 feet (five meters) long and 10 feet (3 m) wide, with highly reflective solar panels. Because of that size difference, Cygnus will usually appear much dimmer compared to the ISS. Seen from a distance of 621 miles (1,000 km) and 50 percent illuminated, it should appear roughly as bright as a third magnitude star and can be categorized as of moderate brightness. For comparison, the star Megrez, which joins the handle with the bowl of the Big Dipper is a third magnitude star. This would make the Cygnus spacecraft capsule about 1,500 times dimmer than the space station! On rare occasions, when Cygnus is passing much closer – about 260 miles (420 km) and is 100-percent illuminated, it can appear to briefly shine at a far more dazzling magnitude of -2.6; that’s as bright as Jupiter. But such favorable circumstances occur infrequently at best, so when you’re watching for it you should expect to see a dimmer object. An artist's concept of Orbital Sciences' unmanned Cygnus cargo spacecraft approaching the International Space Station. Each website will ask for your zip code or city, and respond with a list of suggested spotting times. Predictions computed a few days ahead of time are usually accurate within a few minutes. However, they can change due to the slow decay of the space station's orbit and periodic reboosts to higher altitudes. Check frequently for updates. Another great site is this one: http://www.n2yo.com/?s=25544. It provides real-time satellite tracking and shows you at any given moment during the day or night over what part of the Earth the space station or Cygnus happens to be. Editor's Note: If you snap a photo of Orbital Sciences' Cygnus spacecraft in space, the International Space Station or any other amazing sky view that you'd like to share for a possible story or image gallery, send photos, comments and your name and location to managing editor Tariq Malik at spacephotos@space.com. SPACE.com is providing complete coverage of Orbital's first Cygnus test flight to the International Space Station. Visit SPACE.com for updates on the mission. SPACE.com partner Spaceflight now is also offering updates via its Cygnus Mission Status Center. Email Tariq Malik at tmalik@space.com or follow him @tariqjmalik and Google+. Follow us @Spacedotcom, Facebook and Google+. Original articleSPACE.com.